Homeopathic medicine can treat a range of ailments. Homeopathic medicine is an ancient practice and a reasonable alternative when conventional veterinary medicine hasn't worked. There are several types of homeopathic treatments, commonly used to treat cats with long-term issues or diseases as well as minor ailments and to balance energy. Homeopathic medicine, or homeopathy, is a medicinal approach that embraces the concept that the body can heal itself. It also focuses on healing through administering small doses of substances, which are causing illness or symptoms. The theory is that giving tiny doses in a calculated manner enhances resistance to that particular substance. Homeopathy was founded in Germany in the 1700s, and is commonly practiced in Europe. 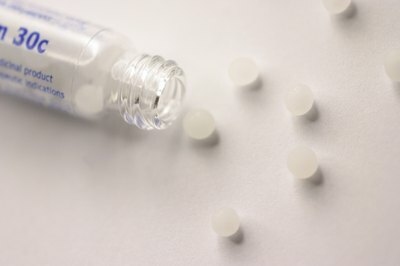 Homeopathic meds are administered in pill or liquid form. Homeopathic meds are grouped by function. Most are known as classical medicines and rely on the work of homeopathy founder Samuel Hahnemann. This approach would match a cat's symptoms with treatments. Constitutional medicines monitor populations and the idea that individuals of similar populations may have similar reactions to remedies; whether this applies to cat breeds is uncertain. Isopathic medicines focuses largely on a "let same be treated by same" philosophy. Allergodes are used for allergy treatment, and remedy mixes are called complex medicines. Each category contains several types of remedies. Single agent remedies, for example, are classical medicines used to balance energy. The philosophy is that one remedy may suit the feline patient as a whole. These remedies are used for a wide range of both acute and chronic imbalances. Examples of single agent remedies include sarcodes, derived from glandulars and designed to strengthen and repair organs, and nosodes, derived from diseases and used to prevent disease. Nosodes are homeopathy's version of vaccinations. The most efficient way to administer homeopathic meds to your cat is under his tongue. Usually, meds are taken several times a day until no longer needed. If your cat's symptoms don't subside, visit your practitioner as your cat may need a different remedy. Before embarking on homeopathic treatment, consult with your vet to rule out any problems that might be addressed with medical care. Keeping your vet apprised also helps him treat your cat in the most effective way possible. WebMD: Homeopathy - What Is It? Can Steroids in Cats Be Discontinued Abruptly?